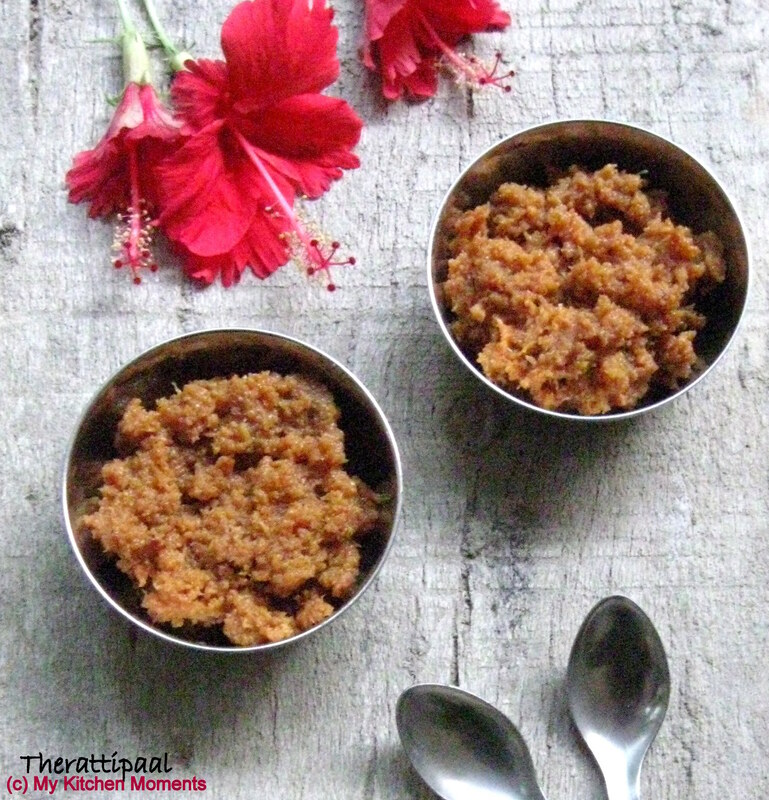 Therattipaal is a traditional South Indian sweet or i could say, the Indian Dulce de leche. 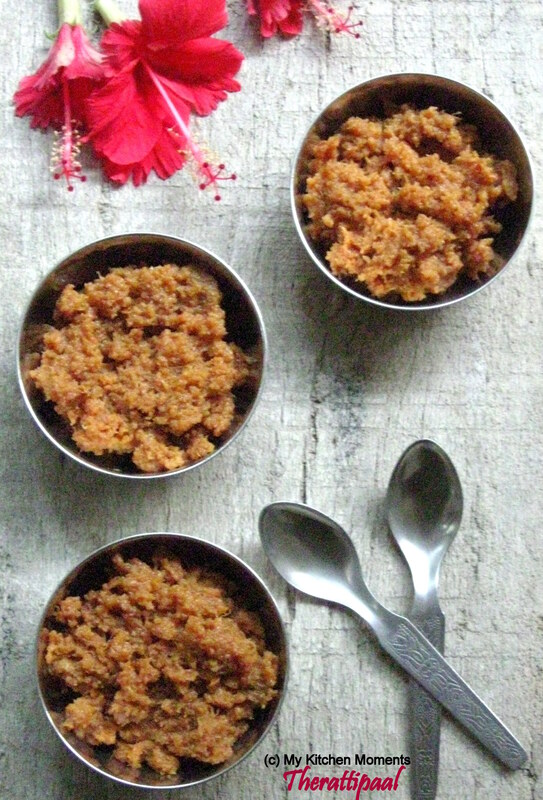 It is a classic sweet during the festivals like Deepavali (Diwali), or any other special occasions at home. It is a very time consuming recipe, but you will never get disappointed with this delicious sweet. During the olden days, every home had cows and they get milk easily. So even after using the milk for the entire family, they usually have excess milk. Thus with the excess milk, they make homemade butter, ghee, buttermilk, milk khoya, therattipaal and so on. Originally, this therattipal sweet is prepared by heating up milk in a heavy bottomed pan for almost an hour or more until the milk thickens to 1/4th its quantity. After which, sugar is added and cooked on a low flame for about 1 to 2 hours while the milk slowly thickens to form Therattipaal. And you have the most yummiest sweet, Therattipaal. It takes around an hour or two, so in earlier days it was usually prepared in an old-fashioned mud stove with dried up branches and leaves of plant for flame. Now a days, the same therattipaal is made using condensed milk and that too on a gas stove or else on a microwave. It is very easy to prepare in a microwave, but one cannot get the original taste. Anyways, once in a while using condensed milk and preparing in a microwave in this present time is acceptable due to time constraints. And i do prepare therattipal in microwave to save time and to satisfy my sweet cravings. There is a slight variation to Therattipaal (also called Pal Therattipaal) and Pal khoa (also called as Pal gova or Milk Khoya). Though both have milk as the main ingredient, Therattipaal is prepared by allowing the milk to thicken up on a low flame and then sugar is added and heated further to get a thick consistency. Thereby allowing the milk solids to get browned by constantly stirring and scraping the sides of the pan. Thus, you get the browned milk solids alone and tastes just awesome. And i will post the preparation of Pal khoa / Pal gova / Milk khoya, the traditional way sometime in the near future. Today, i am posting the Therattipaal – browned and sweetened milk solid recipe, a traditional South Indian Sweet made on a gas stove. Place the milk in a heavy bottomed vessel and keep it on a stove with a medium flame. Allow the milk to boil. Once the milk boils, stir the milk to avoid overflow and lower the flame. Keep stirring now and then. At one stage, the milk gradually gets thicker. Also the color starts to change from white to a light brownish and then gets closer more to the brown side. Continue to stir. Keep boiling and stirring the milk until it becomes thicker and reduces to 1 cup quantity. When the milk starts to become more thick, add in the sugar and continue to stir. After adding sugar, the milk will sure get loosen up. But continue stirring, till it becomes thick again. When it starts to leave the pan, give one complete stir and remove from heat. The delicious Therattipaal is ready to serve. Store the Therattipaal in an air tight container. You get 1 cup of Therattipaal from 1 litre of milk. The Therattipaal serves good for about 1 to 1 & 1/2 week when stored in an air tight container. Do not refrigerate this sweet, as it may spoil the original taste which is best relished at room temperature. Keep stirring the milk now and then to get the right consistency. And also, keep the flame always at low to medium. You can use normal cows milk or whole milk or full fat milk. Switch off the flame when it is just starting to get thicker. Do not wait till it becomes so thick. Because once it cools down, the mixture will get even more thicker. So switch off the flame accordingly. Quick Method: Use condensed milk and whole milk, boil and stir to form a solid consistency. Add sugar, stir and heat up until it thickens. Voila, the Therattipaal sweet is ready. Microwave Method: Condensed milk + whole milk + sugar + microwave until the milk solids thickens. And there you go, the sweet is ready to serve. Sounds delightful. its sweet khoya which can be cut to pieces to make milk cake. Its my family’s favourite. thanks for sharing the recipe. Thank you so much Anita 🙂 Its is nice to know that you cut the sweet khoya into pieces to get a cake!! It is really new to me. Next time when i prepare, i try to cut into pieces to get a milk cake. I can taste it from here……simply awesome…. This looks great! I’m getting hungry! You had me at Indian dulce de leche 🙂 Mouthwatering! Very pretty! Thanks for sharing it. I haven’t heard of this dish before, but it looks so yummy and only has 2 ingredients – I’m sold! Will definitely be trying it out. 🙂 Thank you Raj. Do try it out, you will like it…. You have a nice blog..Happy Blogging..
Hi i have south indian husband who has tasted the original stuff and he said that therattipal shoul feel soft in the mouth and not too grainy which was the case when i used the microwave recipe from a blog. It involved mixing condensed milk 1 ton, 2 tsp ghee and 2 tbsp yoghurt. I microwaved it for around 6 1/2 mins. If im using your microwave method whats the ratio of milk to condensed milk , time taken and how will the texture be ? Hi Khyati, There is a slight variation to Therattipal and Paal khoa. Therattipal is slightly grainy in texture. But Paal khoa has got that soft and melt in mouth texture. What your husband is talking about is called Paal khoa. You can prepare the microwave version of Therattipal with 1 tin Condensed milk and 3 tbsp yoghurt or curd. Mix well and place in a micro wave safe glass bowl and microwave for 2 mins. It will be slightly runny at the initial stage. After 2 mins, take it out and mix again. Now add 1 tbsp ghee and microwave again for 2 mins. It may rise above the bowl, so use a large glass bowl. If it has attained thickness that you desire and no more water is left you can enjoy right away. But if it still runny, stir again and microwave another 1 minute and it is done. Totally it may take around 5 mins. It depends upon the microwave, so keep an on it. The ratio is 1 tin condensed milk (200 ml) and 2 tbsp curd, 1 tbsp ghee. The texture will be slightly grainy for Therattipal, you cant help it.